A decade-long effort led by Stanford University School of Medicine scientists has been rewarded with the identification of the human skeletal stem cell. The cell, which can be isolated from human bone or generated from specialized cells in fat, gives rise to progenitor cells that can make new bone, the spongy stroma of the bone’s interior and the cartilage that helps our knees and other joints function smoothly and painlessly. The discovery allowed the researchers to create a kind of family tree of stem cells important to the development and maintenance of the human skeleton. It could also pave the way to treatments for regenerating bone and cartilage in people. A paper describing the finding, which follows the discovery by the same group of the mouse skeletal stem cell in 2015, was published online Sept. 20 in Cell. Longaker, the Deane P. and Louise Mitchell Professor in the School of Medicine and the co-director of the Stanford Institute for Stem Cell Biology and Regenerative Medicine, is the senior author. The lead authors are Charles K.F. Chan, PhD, assistant professor of surgery; medical student Gunsagar Gulati, MD; Rahul Sinha, PhD, instructor of stem cell biology and regenerative medicine; and research assistant Justin Vincent Tompkins. The skeletal stem cells are distinct from another cell type called the mesenchymal stem cell, which can generate skeletal tissues, fat and muscle. Mesenchymal stem cells, which can be isolated from blood, bone marrow or fat, are considered by some clinicians to function as all-purpose stem cells. They have been tested, with limited success, in clinical trials and as unproven experimental treatments for their ability to regenerate a variety of tissues. Recently, three elderly patients in Florida were blinded or lost most of their sight after mesenchymal stem cells from fat were injected into their eyes as an experimental treatment for macular degeneration. Skeletal regeneration is an important capability for any bony animal evolving in a rough-and-tumble world where only the most fit, or the fastest-healing, are likely to survive very long into adulthood. Some vertebrates, such as newts, are able to regenerate entire limbs if necessary, but the healing ability of other animals, such as mice and humans, is more modest. Although humans can usually heal a bone fracture fairly well, they begin to lose some of that ability with age. And they are completely unable to regenerate the cartilage that wears away with age or repetitive use. Researchers have wondered whether the skeletal stem cell could be used clinically to help replace damaged or missing bone or cartilage, but it’s been very difficult to identify. Unlike embryonic stem cells, which are present only in the earliest stages of development, adult stem cells are thought to be found in all major tissue types, where they bide their time until needed to repair damage or trauma. Each adult stem cell is lineage-restricted — that is, it makes progenitor cells that give rise only to the types of cells that naturally occur in that tissue. For our skeleton, that means cells that make bone, cartilage and stroma. Chan, Longaker and their colleagues had hoped to use what they learned from identifying the mouse skeletal stem cell to quickly isolate its human counterpart. But the quest turned out to be more difficult than they had anticipated. Most cell isolation efforts focus on using a technology called fluorescence activated cell sorting to separate cells based on the expression of proteins on their surface. Often, similar cell types from different species share some key cell surface markers. But the human skeletal stem cell turned out to share few markers with its mouse counterpart. Instead, the researchers had to compare the gene expression profiles of the mouse skeletal stem cell with those of several human cell types found at the growing ends of developing human bone. Doing so, they were able to identify a cell population that made many of the same proteins as the mouse skeletal stem cell. They then worked backward to identify markers on the surface of the human cells that could be used to isolate and study them as a pure population. The researchers showed that the human skeletal stem cell they identified is both self-renewing and capable of making bone, cartilage and stroma progenitors. It is found at the end of developing bone, as well as in increased numbers near the site of healing fractures. Not only can it be isolated from fracture sites, it can also be generated by reprogramming human fat cells or induced pluripotent stem cells to assume a skeletal fate. Intriguingly, the skeletal stem cell also provided a nurturing environment for the growth of human hematopoietic stem cells — or the cells in our bone marrow that give rise to our blood and immune system — without the need for additional growth factors found in serum. By studying the differentiation potential of the human skeletal stem cell, the researchers were able to construct a family tree of stem cells to serve as a foundation for further studies into potential clinical applications. Understanding the similarities and differences between the mouse and human skeletal stem cell may also unravel mysteries about skeletal formation and intrinsic properties that differentiate mouse and human skeletons. The skeletal stem cell we’ve identified possesses all of the hallmark qualities of true, multipotential, self-renewing, tissue-specific stem cells. “Now we can begin to understand why human bone is denser than that of mice, or why human bones grow to be so much larger,” Longaker said. In particular, the researchers found that the human skeletal stem cell expresses genes active in the Wnt signaling pathway known to modulate bone formation, whereas the mouse skeletal stem cell does not. The ultimate goal of the researchers, however, is to find a way to use the human skeletal stem cell in the clinic. 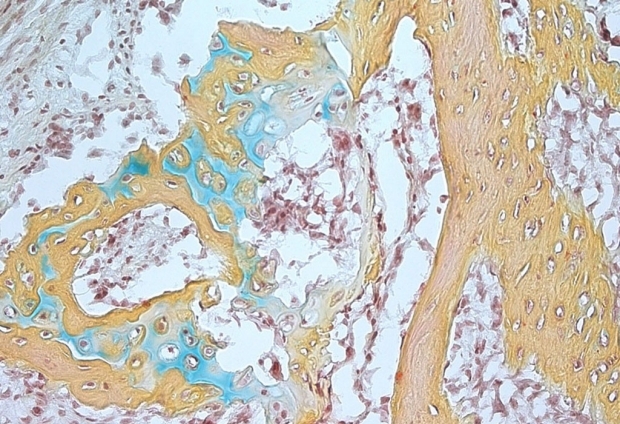 Longaker envisions a future in which arthroscopy — a minimally invasive procedure in which a tiny camera or surgical instruments, or both, are inserted into a joint to visualize and treat damaged cartilage — could include the injection of a skeletal stem cell specifically restricted to generate new cartilage, for example. Longaker is a member of the Stanford Child Health Research Institute, the Stanford Cardiovascular Institute, the Stanford Cancer Institute and Stanford Bio-X. Additional Stanford authors are CIRM Scholars Michael Lopez, Rachel Brewer, and Lauren Koepke, former graduate students Ava Carter, PhD, Ryan Ransom, graduate students Anoop Manjunath, and Stephanie Conley; former postdoctoral scholar Andreas Reinisch, MD, PhD; research assistant Taylor Wearda; clinical assistant professor of plastic and reconstructive surgery Matthew Murphy, MD; medical student Owen Marecic; former life sciences researcher Eun Young Seo; former research assistant Tripp Leavitt, MD; research assistants Allison Nguyen, Ankit Salhotra, Taylor Siebel, and Karen M Chan; instructor of stem cell biology and regenerative medicine Wan-Jin Lu, PhD; postdoctoral scholars Thomas Ambrosi, PhD, and Mimi Borrelli, MD; orthopaedic surgery resident Henry Goodnough, MD, PhD; assistant professor of orthopaedic surgery Julius Bishop, MD; professor of orthopaedic surgery Michael Gardner, MD; professor of medicine Ravindra Majeti, MD, PhD; associate professor of surgery Derrick Wan, MD; professor of surgery Stuart Goodman, MD, PhD; professor of pathology and of developmental biology Irving Weissman, MD; and professor of dermatology and of genetics Howard Chang, MD, PhD. Researchers from the Medical University of Graz in Austria, RIKEN in Japan and the University of California-San Diego also participated in the study. The study was supported by the National Institutes of Health (grants R01DE027323, R56DE025597, R01DE026730, R01DE021683, R21DE024230, U01HL099776, U24DE026914, R21DE019274, U01HL099999, R01CA86065, R01HL058770, NIAK99AG049958, P50HG007735, R01 R055650, R01AR06371 and S10 RR02933801), the California Institute for Regenerative Medicine, the Howard Hughes Medical Institute, the Oak Foundation, the Hagey Laboratory, the Pitch Johnson Fund, the Gunn/Oliver Research Fund, a Siebel Fellowship, a PCFYI Award, Stinehart/Reed, the Deutsche Forschungsgemeinschaft and the Ellenburg Chair. The researchers have a pending patent for the isolation, derivation and use of human skeletal stem cells and their downstream progenitors. Researchers from the Medical University of Graz in Austria, RIKEN in Japan and the University of California-San Diego also contributed to the study. Stanford’s Department of Surgery also supported the work. Newer PostTargeting senescent cells for apoptosis extends life... fountain of youth? Older PostOptions: When you can provide it all, patients win.